Santa chose the best tree. 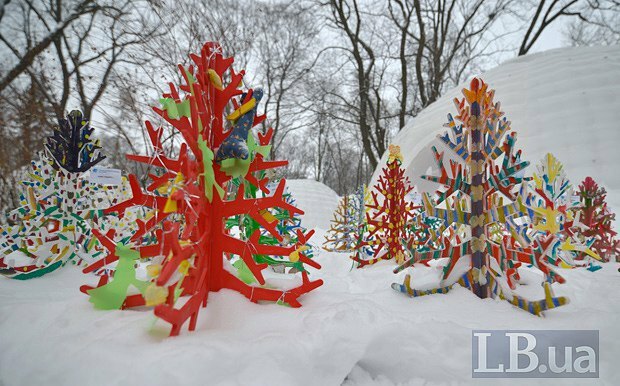 Kyiv's Mariyinskyy Park, where Santa Claus residence in Ukraine is headquartered, arranged on 10 January an exhibition of plywood Christmas trees with handmade decorations, created by the students of metropolitan school. An LB.ua reporter was told that the panel of judges of the competition for the best Christmas tree included representatives of the European school of designers and Santa Claus family. The Santa Claus town at the Mariyinskyy Park consists of several igloos, warm dome spaces, a toy shop, New Year's post office and Santa's residence.